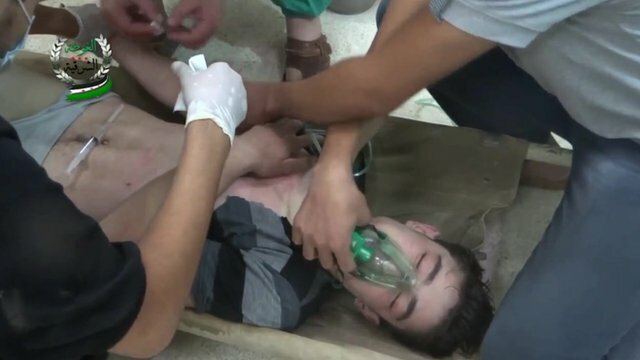 In the early hours of 21 August, graphic footage started to flood social media sites showing victims of an alleged chemical weapons attack on civilians in and around the agricultural belt of the Ghouta, around the Syrian capital of Damascus. Syrian opposition activists had earlier reported heavy fighting in eastern Damascus in districts that were primarily rebel strongholds. But the first reported use of chemical weapons came at 0245 (local time) in Ein Tarma and again at 0247 in Zamalka. A doctor in Irbin, north-east of Damascus, told Human Rights Watch the attack started there at 0300. Shortly after, dozens of videos were uploaded of distressed and visibly sick adults and children in makeshift hospitals but with no external injuries. In some of the most graphic footage, dozens of bodies, including many small children and babies, were seen laid out in rows on the floor of a clinic. WARNING: You may find some images disturbing. Online images showed victims of the attack convulsing, with pinpointed pupils, excessive saliva and difficulty in breathing. While opposition activists initially said 300 people were killed in the attack, the casualty figure they gave quickly rose to over 1,000 people. Casualties were reported in the areas of Irbin, Duma and, to the west, Muadhamiya, among others. Opposition activists accused the Syrian government of carrying out the attack as part of a wider scale operation to edge the rebels further outside of the capital. They said army rockets dropped toxic agents onto civilian areas. The Syrian government, however, has strenuously denied that it has ever used chemical weapons. Immediately after the attack, the Syrian army denied using poisonous gas, describing the claims as “false and completely baseless”. Syrian Information Minister Omran Zoabi said the attack would not be possible because of the presence of the government’s own forces in the area allegedly affected. Syrian officials have suggested that the opposition were behind any such attacks and that they were encouraged in this by Western powers. Deputy Foreign Minister Faisal Mekdad insisted it was a tactic by the rebels to turn around the civil war which he said “they were losing”. The government had previously admitted to having stocks of chemical weapons, however, they stated they would never be used “inside Syria”. 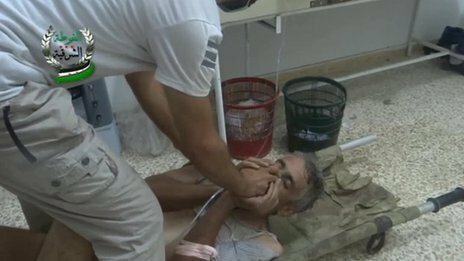 Initial reports and video footage of the attack emerged from social media sources, making the claims difficult to verify and causing many to reserve judgement on whether chemical weapons were actually used. Despite this, chemical weapons experts said the large volume of visual evidence would be difficult to fake. Three days after the attack, medical charity Medecins Sans Frontieres confirmed that three hospitals it supports in Damascus treated about 3,600 patients with “neurotoxic symptoms” on the day of the attack. They said 355 of these died. Medical experts said large numbers of patients displayed convulsions, pinpointed pupils, excessive saliva and difficulty in breathing – all tell-tale signs of nerve agent poisoning though most likely to be sarin. They were treated with atropine and other known antidotes, which the medics said worked in many cases, despite running out of treatments. 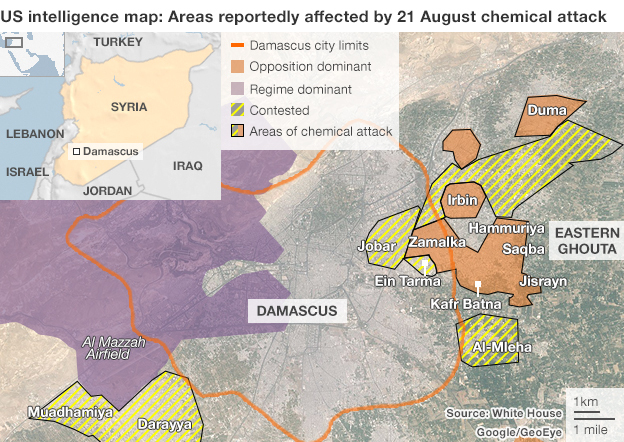 A team of UN chemical weapons experts already in Damascus to investigate separate allegations of chemical weapons use managed to gain access to the sites near Damascus on 26 August, five days after the attack occurred. For four days, they spoke to survivors, nurses and doctors and took blood and urine samples from the districts affected. They have since returned to The Hague and are awaiting the results of their findings, which they will then present in a final report to Secretary General Ban Ki-moon. But the UN team is only responsible for investigating whether chemical weapons were used, not who used them. Western governments have also been trying to substantiate the claims of chemical weapons use in Syria. 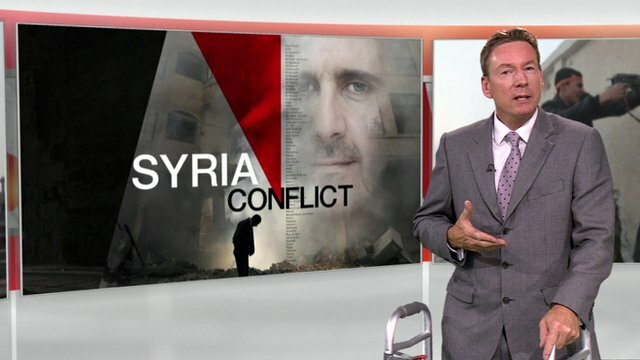 The British government made public a UK Joint Intelligence Committee (JIC) assesment into the attack on 29 August, in which it clearly stated a chemical weapon attack had taken place, saying it was “highly likely” the Syrian authorities were responsible. The assessment said confidently that the Assad government was behind 14 separate chemical attacks in Syria, and that it had “some intelligence to suggest regime culpability” in the Damascus attack. The intelligence analysis also suggested the rebel forces did not have the capability to deliver chemical weapons. It did, however, admit it did not understand why the government would deploy chemical weapons when in the presence of the UN team in the capital. The Obama administration has also weighed in with its own intelligence analysis. US Secretary of State John Kerry has accused Syria of using chemical weapons to kill 1,429 people, including 426 children, citing a US intelligence assesment. It said Syrian military chemical weapons personnel were operating in the area over a three-day period before the attack and satellite evidence shows rockets launched from government-held areas 90 minutes before the first report of chemical attack. US intelligence services also intercepted communications between a senior Damascus official who “confirmed chemical weapons were used” and was concerned about UN inspectors obtaining evidence. Shortly after this intelligence release, Mr Kerry said he had firm evidence sarin was used in the attack, namely from samples of hair and blood from emergency workers who attended the scene. Russia – which, alongside China, supports the Syrian government – has challenged the US to present its evidence, with President Vladimir Putin describing claims the government was behind the attack as “utter nonsense”. Russian officials instead suggest Syrian rebels were behind the attack to try to provoke the international community to respond with military action.